The Club at Millenia is a gated community situated just minutes from the coveted Mall at Millenia, Universal studios, and the Prime Outlets. With nine different floor plans to choose from and a variety of upgrade options, you're sure to find the perfect home. 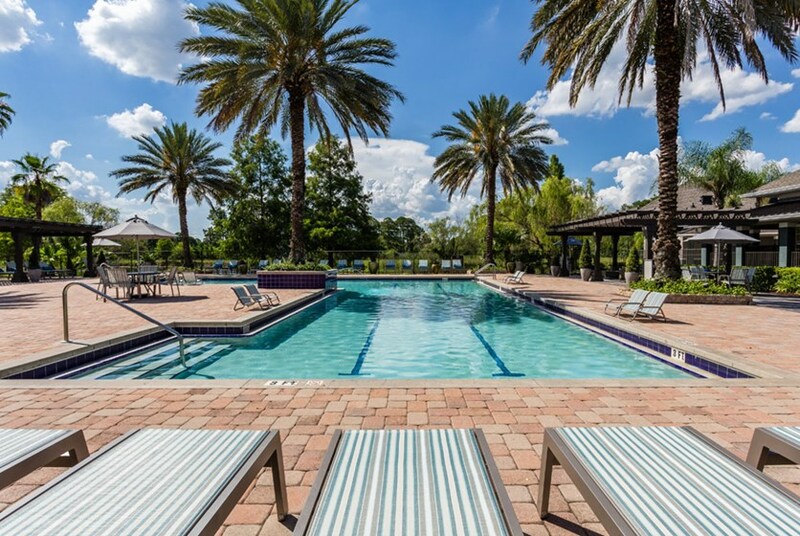 Enjoy the day exploring Orlando or stay home and enjoy excellent amenities, including access to three resort style pools and weekly fitness classes. Soak up the Florida sun at one of the three resort style swimming pools, relax in the hot tub, or grill poolside with friends. Get fit at the fitness center or take a fitness class, like zumba or karate, offered twice a week in the multi-purpose room. Rent out the community's multi-purpose room for your next party or catch up on work at the business center with free WiFi. The community is pet friendly with no weight restrictions: let your furry friend can roam free in the dog park! Just 2 miles from the Mall at Millenia and Orlando International Premium Outlets where you'll find some of the best shopping. Every apartment includes a washer and dryer, exterior storage, water, sewer, and valet trash, all included in your monthly rent. Upgraded apartments include stainless steel appliances, subway tile backsplash, wood-style flooring, granite-like countertops, and upgraded hardware. Bay windows, ice makers, ceiling fans, vaulted ceilings, and microwaves are available in many apartment homes - be sure to ask about these features! Some floor plans include patios, breakfast bars, walk-in closets, pantries, linen closets, alarms, and nature views. Reserved covered parking spots and private garages are available for rent. We've sent your message off to The Club at Millenia. If you'd like to chat with the staff immediately, feel free to call them at (407) 449-8253. If you would like to chat with the The Club at Millenia staff before your tour, you can call them at (407) 449-8253. We're checking availability for you now! Someone from the leasing team will contact you shortly. Meanwhile, please feel free to call The Club at Millenia at (407) 449-8253.